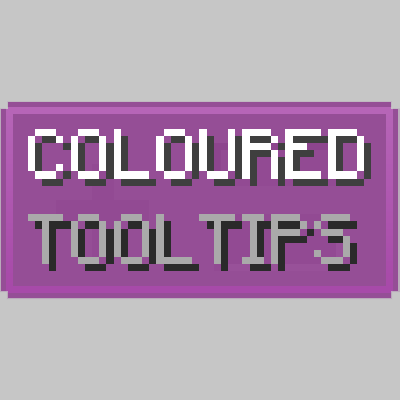 This mod allows for the colours of tooltips to be changed using a configuration file. The config file can be found in config/colouredtooltips.cfg. Colours in this mod use ARGB hex strings. These are like normal RGB hex strings, but there are two extra characters at the start which control how transparent something is. If you are not familiar with hex colour codes, I would recommend using the google colour picker to get the colour you want. Once you have a good colour, replace the last six characters of the config file value with the six characters for the colour you want. This mod will change the colour of all tooltips that use Forge's tooltip rendering code. This includes item tooltips and various GUI tooltips like the names of creative tabs and likely tooltips in the GUIs of other mods. This mod is properly labled as client side. It is safe to install on a server, however installing it on a server will have absolutely no benefit. Unfortunately this mod uses a new feature in Forge to work, so unless forge adds it to previous versions, I can not make updates for older versions. Forge is also not adding new features to older versions so there isn't much that can be done here.